Botanists have used perennial plants for thousands of years in the same way as the Earth's major annual food crops. In the beginning, forest trees were little modified by their human "allies" as exploited wild plants, but this study by Drs. Allison J. Miller and Briana L. Gross assigns an intermediate period to the woody plants bred and modified extensively for domestication ("incipient domesticates"). Perennials now exclusively grown in a farm-like environment and unable to survive "without human intervention" are assigned the final, totally-domestic period. The reason for the study is the paucity of studies on the perennial seed-plant's domestication. Academically, the joy is in understanding evolution in these long-lived species and how much of their response to selection pressure is short-term. The long juvenile phase, extensive outcrossing, use of both sexual and asexual modes of reproduction and widespread hybridisation of these plants and trees are just the more obvious causes of bottlenecks for those breeding them. The selection undergone by the plants has been studied even where the morphological or genetic divergence from wild-type is slight. 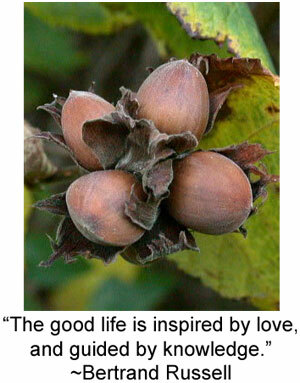 Our hazelnut trees for example often closely resemble real wild trees, except for nut size. Many perennials grow for a long time before reproducing, and are cloned extensively, so reducing the number of sexual cycles that separate the farmed plant from its ancestor. A slow rate of evolution may be expected, but strangely, many such crops show great morphological and genetic divergence. Cassava root, potatoes, fleshy fruit and nuts all show different responses to artificial selection, depending on whether they are short-lived (less than five years) or long-lived perennials or whether the target organ is a vegetative root, stem or leaf or a reproductive part. It is important to note that annual crops that used to be perennial in the wild were not included in the study. This includes tomatoes, Capsicum chillies and eggplant. Allison and Brianna concentrated on trees bred for their reproductive parts, despite the generation-time problem. While you would think the tempo of evolution in trees would be slow, prepare to be surprised. Natural populations have a propensity for variation and weak population structure.. They are also very locally adaptable, although the mutation rate needs to be studied more. Basically annuals have 2.7-10X the mutation rate of perennials, but somatic mutation is more prevalent in perennials as is hybridisation. It might be obvious that hybrids have been very "potent", particularly in fruit crops, in order to produce our newest crops. As far as reproductive traits are concerned, self-compatible wild ancestors for perennials are rare, but dioecious perennials (those with two sexes) have evolved various breeding tricks, often becoming hermaphrodite. Despite 75% of farmers relying on clonal techniques, striking changes occurred in perennial fruit crops. Unisexual flowers have become bisexual in grapes; the black pepper, Piper nigrum, has changed from dioecious to monoecious, and the banana has achieved its well-known parthenocarpy (development without pollination), as have the fig, pear and pistachio. Flowers, seed and fruit have also changed. Less toxic seed, higher seed oil content and lower rate of dormancy are common, partly because of human demand. More features have developed in some perennials, including higher oil content in the non-seed areas and thinner shells. 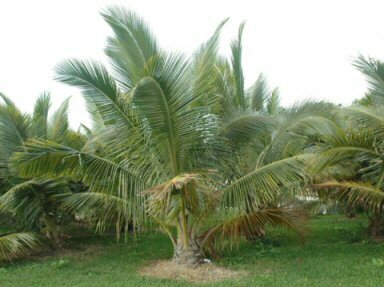 Non-reproductive change of interest includes dwarfism ( one example is in the Fiji dwarf coconut), a reduction in defensive structures and polyploidy. The subsets of wild populations brought into cultivation have an obvious lack of variation compared to the whole genome. Selective propagation causes a further narrowing of the genetic possibilities, such that only 59.9% of neutral variation remains in the average fruit crop in annual plants. In perennials variation is very different. They retain 94.8 % of the neutral variation in wild trees, revealing far greater genetic potential. Older perennial fruit crops such as apple, olive, grape and pistachio are among the most successful at this retention. Archaeology and genetics have combined to study domestication events. Since 1886, authors have examined the often diffuse geographic origins of fruit crops, with only five having a single point of origin! Genetic mapping has revealed cases such as the double genome of certain citrus trees. This is a huge area for future work, although many fruit trees are currently undergoing genome investigation. Most important, sustainable agriculture is seen as using perennials to lower environmental impact. Ecology and botany together must account for a vast amount of work needed on how we treat the future environment.